DANANG, Vietnam—Prime Minister Justin Trudeau said it shouldn’t have come as a surprise to anyone when Canada declined to sign an agreement-in-principle Nov. 10 on an updated Trans-Pacific Partnership trade deal. Trudeau said Nov. 11 in Vietnam that despite some significant progress on the deal’s framework there’s still more work to be done, particularly when it comes to protecting Canada’s auto and cultural sectors. His decision to keep negotiating for a better deal in the 11-country pact rather than striking an agreement led to the abrupt cancellation of a TPP leaders’ meeting on the sidelines of a summit of the Asia-Pacific Economic Co-operation. “We were not going to be rushed into a deal,” Trudeau told reporters at his closing APEC news conference. 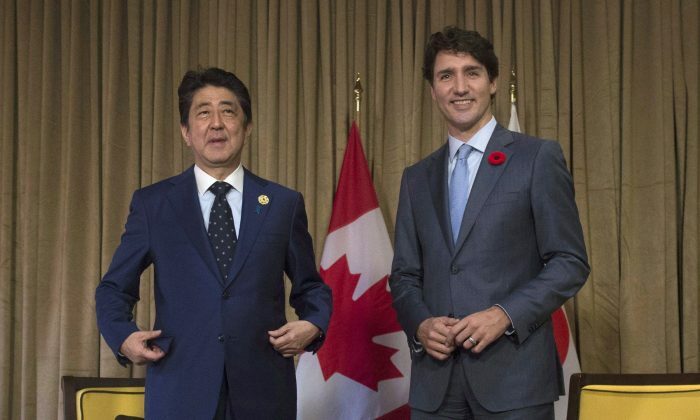 “We obviously had lots to talk about and at the end of that meeting it became clear that it was in everyone’s interest to postpone the leaders’ meeting on the TPP11,” he said. However, International Trade Minister Francois-Philippe Champagne announced progress had been made.